This site maintained by Kevin Savetz. 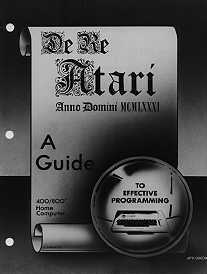 De Re Atari is copyright © 1982 by Chris Crawford, et al, and is posted on www.atariarchives.org with the permission of the author. Do not redistribute, mirror, or copy this online book.